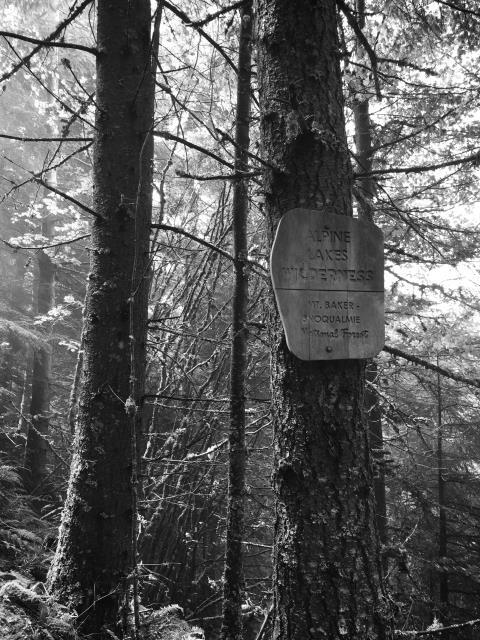 A misty shot of the Alpine Lakes Wilderness sign on the way to Mason Lake, posted for Sally D’s Mobile Photography Challenge: Black and White. What a great idea to take a photo of where you’ve parked your car! 🙂 Mysterious B&W images for the challenge. I like them. I like your idea! I have been lost in a parking lot too many times..lol! That’s actually really clever. Never thought of using my camera as a navigation device. Awesome! I love pictures of trail signs, signposts and whatnot. It’s a funny, impulsive habit of mine that a few of my photographer friends share and we just agree it’s an enjoyable way to look back and remember different parts of a trail. They always look really good in collages or arrangements with your best or favorite images, too. Someday I’ll put all of my wilderness sign pictures together and see how many different wilderness areas I’ve visited. A lot of them will be from Alpine Lakes Wilderness, which covers such a big area around here! It’s nice to hear I’m not the only one, Amy. 🙂 Thanks for your visit today! It’s always wonderful to just wander in a wilderness area and find unusual things of beauty. Lisa, I take images of signs or similar information so that I know the name of a plant at a botanical garden or the street where I have taken a photograph. But taking signs of where you are in the wilderness is a smart one. Often when I am walking in a new protected area, I memorize signs from the wildlife, but your idea will be embedded for the next hike. You image shows the beauty in the simplest of scenes of nature, and how the light plays such an important role. Happy Photo Challenge. The light is my favorite part of this image, Sally so I’m happy to hear you share the same thoughts. I have walked by that sign many times over the past few years and thought about it each time I passed; I love your response to the challenge.